Last round's answer was Akito/Agito Wanajima from Air Gear! Today Conan was walking through the woods when he RAN INTO A SPOOKY GHOST AAH. But it wasn't like any ghost he'd ever seen before-- as a matter of fact, it didn't look like a ghost at all. And it kept saying something weird, over and over, almost like it couldn't say anything else. Before he could investigate further, a guy in weird looking purple scarf and purple headband came running up. It turns out that the creature really was a ghost, but some kind of creature Conan had never heard of! And the guy was some kind of futuristic seer, and he also ran a gym where he trained these guys. Weight training?? How can you make ghosts lift weights, really?? Tell Conan the name of this guy and the series he comes from to earn three random cards! This round ends Thursday, October 24th at 12:01 a.m. PST! Today Conan was out getting some sun. He was making his way through a park when he saw something strange. There was a small kid with an eyepatch, and he was roller..blading? Only those were the weirdest skates he'd ever seen, and the kid was moving really fast. Conan was going to ask him what he was doing, but then the eyepatch the kid was wearing flipped over to the other side and he started getting really rude and even talking different! It was like he was a whole other person! Conan didn't want to associate himself with crazies, so he decided to just go on home. What a weirdo. This round ends Thursday, October 17th at 12:01 a.m. PST is closed! The Host Club is looking to gain some new customers, so they're passing out free cards! Comment here to give them your patronage and receive three cards! This round ends on Thursday, October 17th at 11:59PM PST! Today Conan came across a beautiful looking horse standing in the middle of the sidewalk. Wait, what?? When he got closer, he saw that it wasn't a horse at all-- or was it? -- it was actually a handsome young guy! He could have sworn he saw a horse, though... so he decided to investigate. He found out that the guy was some sort of creature called a kelpie, and he was trying to find the woman he loved so he could bring her the moon and get her to fall in love with him. Moon? What?? Was this guy for real? Tell Conan the name of this guy and the series he comes from to earn three random cards! As an added bonus, if you tell me his "given name", I'll throw in one extra card! :) So that's four cards possible! This round ends Thursday, October 10th at 12:01 a.m. PST closed! Today Conan decided to stop at a local restaurant for something to eat. While there, he came across a strange girl dressed in some kind of miko outfit. She was stuffing her face like crazy, way more than any normal girl could eat! He decided to talk to her, and found out some pretty interesting things. Apparently she was found by a head priest and raised to become a priestess at a shrine back home. But, she went on to say, her temple was massacred and she was forced to flee from people that wanted to kill her. She was saved by an assassin with a giant kunai, and she said she'd been traveling with him ever since. Before Conan could hear more, a beautiful blond woman appeared to pick up the miko girl. She looked like a foreigner, and introduced herself as someone "from the glacier". They left together, and when Conan turned back around to eat his dinner he saw... ice shards?? What?? Did the blond woman leave them, or had they been there this whole time?? This round ends Thursday, October 3rd at 12:01 a.m. PST closed! The Host Club is looking to gain some new customers, so they're passing out free cards! Comment here to give them your patronage and receive two cards! This round ends on Thursday, October 3rd at 11:59PM PST! Last round's answer was Haruka Nanase from Free! Today Conan ended up exploring an island that boasted a rather impressive military academy. As he was wandering around, enjoying the sights and the smart-looking uniforms he accidentally bumped into someone. He was going to apologize, but when he looked up the guy had the most beautiful eyes he'd ever seen. They had to have been fake or something, because when Conan asked the guy said that they were "peacock eyes". He seemed a little awkward about it, and went on to explain that the island they were on was famous for its genetic engineering, and that while most people paid big bucks to have stuff made with peacock eyes, his were the real deal. Because this round might be a little difficult, I'm going to up the prize. Tell Conan the full name and the series this guy is from to earn three random cards! Do your best! This round closes on Friday, September 20th at 12:01 a.m. PST! Closed! This round ends on Thursday, September 19th at 11:59PM PST! closed! Man, today was really hot! Conan got so thirsty that he ended up stopping by the local grocery store to pick up a bottle of water. He was drinking it on the way home when he ran into this weird high schooler that just kept. Staring. At his water bottle. He was gonna offer him some to drink - maybe he was thirsty? - but then the guy started stripping. What a creep! Luckily he was wearing his swimsuit under his uniform, but Conan hightailed it out of there as fast as he could! Tell Conan the full name and the series this guy is from to earn two random cards! This round closes on Thursday, September 12th at 12:01 a.m. PST closed! I'm so sorry this is late guys :( Prizes to be passed out after I get home from work tonight/tomorrow, and next round will go up as planned!! Last round's answer was Kuroko Tetsuya from Kuroko no Basket! Conan was invited to watch a special event at one of the local high schools. They called it "rhythmic gymnastics", but the girl who was competing was using mallets and swords! What kind of sports event is that? She called herself "the Black Rose" and after she won, declared that the match was dedicated to her fiance. She's in high school and engaged already?! Last round's answer was Ky Kiske from Guilty Gear! Conan ended up being caught in a street basketball game when he was walking home from school today. He didn't play, of course, he just watched. During the game he noticed something really strange, though; there were a bunch of really incredible passes being made by... someone?? Even though he tried to pay attention, he couldn't even tell where they were coming from, kind of like they were being made by a phantom. How strange! When the game was over, though, he suddenly noticed a short boy with pale blue hair making his way off the court. Had he been there the whole time?? Tell Conan the name and the series this guy is from to earn two random cards! This round closes on Thursday, August 29th at 12:01 a.m. PST! You still have some time to comment to the last round, so if you didn't make sure you do! This round ends on Wednesday, September 4th at 11:59PM PST! Last round's answer was Hosaka from Minami-ke! Today Conan came across a handsome blonde man in a really elaborate blue and white uniform with a matching sword that... really wasn't very sharp. Conan just had to say hello -- what was up with that outfit, anyway -- and when they got to talking, he found out that he used to be a part of an organization called the Sacred Order of Holy Knights. Well, that explains the weird outfit... He also seemed really earnest and fixed on justice and righteousness, just like a true knight! Before Conan could get his name, he ended up being called away to something urgent, but as he left Conan thought he saw lightning??? coming off of his sword... huh. Tell Conan the name and the series this guy is from to earn two random cards! This round closes on Thursday, August 22nd at 12:01 a.m. PST! Tell Conan the name and the series this guy is from to earn two random cards! This round closes on Thursday, August 15th at 12:01 a.m. PST is closed! So here's how it goes down: the Host Club is looking to gain some new customers, so they're passing out free cards! Because it's been a little while since they tried to drum up some business, they're a little... antsy. So to celebrate their ~grand return~ they're giving out three random cards instead of two this round! Comment to receive yours! This round ends on Wednesday, August 21st at 11:59PM PST! 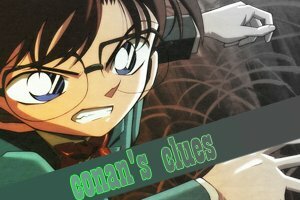 Today Conan passed by a ~mysterious swordsman~ who was asking around for his sister. Bunny? What kind of name is that? He was going to use his awesome detective powers to help, but when he turned to go help the man he saw that instead of a face, there was a... wolf's head. Of course he high-tailed it out of there, but sheesh! What kind of a person has a wolf's head for a face? Tell Conan the name and the series this guy is from to earn two random cards! This round closes on Thursday, August 8th at 12:01 a.m. PST! Last week's answer was whatever Aru says it was! So today, to make up for there not being a round last week (sorry about that guys :c) you get a super special ~Double Round~! So I'm looking for two (2) names, here! Tell Conan the names and series these two are from to get four random cards! This round closes on Thursday, August 1st! CLOSED!! THE NEW MASTERIES POST IS HERE! So you've collected all 20 cards from a deck? Or have you completed a Portfolio? If you've completed a deck, please claim your rewards with one of the forms below. If you've completed your portfolio, please comment with a link to your portfolio and a link to your card post. You may only master a deck once! If you are a returning player and have mastered the deck during your previous time here, you may of course master the deck again.